It’s time to celebrate and kick up your heels – if not for the start of a great new week, then for the next major upcoming holiday, Valentine’s! Try using champagne instead of water to thin down our liquid concentrate soap. It makes a great hand soap as well as a fabulously luxuriant bubble bath. 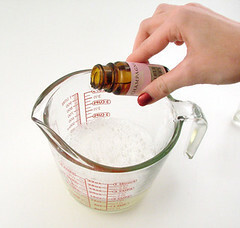 Optional: Champagne fragrance oilThe key to making this recipe work is to use an ultra thick bath gel, like Bramble Berry’s Liquid Soap Concentrate or Suspending Soap Base. 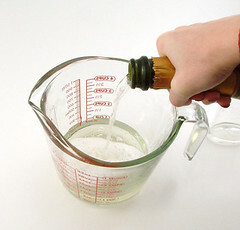 If you use the Suspending Soap Base, use only 2 to 3 ounces of champagne. The Suspending Base takes extra liquids but in a 1:2 ratio. Mix all ingredients together slowly and evenly. You need only a small amount of fragrance oil, approximately 6 ml of fragrance in 12 to 16 ounces of soap. If you’re using the Suspending liquid soap base, now is the time to sprinkle in some glitter. The beauty of the Suspending liquid soap base is that it easily suspends heavier additives, like glitter. 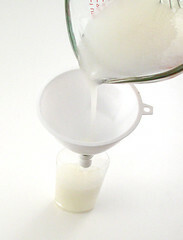 Most liquid soap bases won’t suspend glitter but the Suspending liquid soap base will. Hint: the faster you mix, the more bubbles you will whip into your soap. Gentle and patient stirring is the best way to go with this project. After you are done stirring, let the soap sit for ten to twenty minutes to allow all the bubbles to rise to the top of the soap mixture. Now that the soap has sat, the bubbles should all be sitting at the top of the soap. 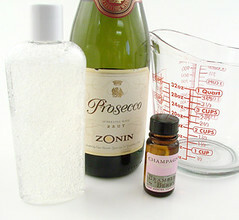 Give the soap mixture a spritz with rubbing alcohol to get rid of some of those bubbles. Pour into bottles. If you don’t have a very steady hand, it’s not cheating to use the right tool (a funnel) to complete the job. Lather up with it as a shower gel or use it in the bath for lots of bubbles. Either way, you’ll be bathing in luxury with soap bubbles and champagne bubbles. The best soap supplies on the internet are found at Bramble Berry. Click here to browse Bramble Berry. Have a question about this blog post? Come join us at Bramble Berry’s Facebook page and we can help you out with any of your soapy questions! Enter your email address below and you will receive all our new posts directly in your email inbox. Mmmm. champagne. Oh and a bath how lovely. I could add this with my wine soaps. That is an *awesome* question. I found that the bubbles dissipated so much during the stirring process that there wasn’t much left when it was done and bottled. Yes, SoapyLove is writing a book and I can hardly wait to stock it. It will be available to reserve a copy this summer on Amazon.com, but hard copies will not be available until the Fall (which is when I will be able to stock it in Bramble Berry). That is sooo cool! Thanks for sharing! I love reading your posts!!!! I love your Champagne FO! I plan to make most of my wedding favours in this scent (perhaps mixed with a little strawberry! ), and a bubble bath would be incredible! Great ideas, every time! I am really tempted to get some inexpensive sparkling wine to try out all the recipes you’ve posted. I love BB’s champagne FO!! Earlier last year I heard that soapy love was going to come out with a new soap book. I was just wondering if it has come out yet and if you know where its available. What a fun idea!! I can see it now…glass of champagne in one hand, chocolate in the other, candlelight and a wonderful soak in champagne bubble bath. That’s a definate Valentines day must do!! If you use a closed container while the bubbles are still in the champagne; is that anything to worry about? Which Face Mask is Right for You? Which Clay is Right for Your Skin? Want to Start Your Own Soap Business? Unless stated otherwise, all images are original material and are copyrighted. If you'd like to use an image, please be a friend and credit the photo and link back to Soap Queen. Feel free to share, tweet and pin to your hearts content.